Newbery, Caldecott Awards Announced Today! 2011 Caldecott Awards Announced! This past Monday at the American Library Association’s mid-winter conference, Jerry Pinkney earned his first Caldecott Medal awarded annually to the artist of the most distinguished American picture book for children. Well deserved, I might add. 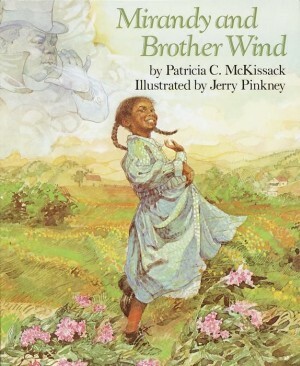 Pinkney had previously won five Caldecott Honor awards over his forty year career. Winning the Caldecott Medal enhances the collectibility and value of an illustrator’s books, so this an opportune time to examine Jerry Pinkney’s body-of-work from a book collector’s perspective. For the newby to this site ‘book collectors’, in context here, collect first edition books. For inexplicable reasons, first edition books are sought after by people who don’t have the ability to reason ‘Why?’. We can only explain how we do, and what we do, and where we do, but not why we do. We just do. Because of what we do, first edition books rise in value in the book collector’s market, which is oft referred to as the secondary market. Primary is the new book market, composed of Amazon along with ever decreasing numbers of brick & mortar stores. In comparision, the secondary market is full aft and fore of more savory characters than not, with venues ranging from physical locations to electronic ones, from eBay to thrift stores, and includes specialized pre-owned book sites such as Abebooks and Alibris. Book collectors constantly foray for first edition books ever pressing forward to quench the growing lust to own. There is a small sub-class of book collectors who apply reason to their collecting "Why? ", and collect books they think might appreciate in value over time. For them, I write this. Lustful types stay away. The progression of Pinkney’s early illustration career is similar to others. At the start of his career he didn’t have the notoriety or following to both author and illustrate a book – publishing companies don’t usually embrace the risk/reward ratio to gamble on unproven talent. Because of this, early in their careers illustrators might do dust jackets or embellishments on chapter books, work which they usually get piece pay rather than royalties. During the next phase of their career they usually illustrate stories written by others, getting a share of the creator royalties. Once established with some market success, a publishing company will feel warranted to risk both authorship & artwork, and young struggling illustrator earns 100% of the creator royalties. Often, the illustrator’s intial foray into authorship is doing an ABC book, something which doesn’t require a large quantity of creative writing, having a predictable beginning, middle, and end, or perhaps to illustrate a story in the public domain, such as a nursery rhyme, fairy tale, Aesop’s tale or something of the sort. This is affectionately called ‘adapted by’ within the industry, and explains the abundance of Cinderella, Red Riding Hood, Jack & Jill, and Beauty and the Beast books on the market. Eventually the illustrator will write their own stories. Some illustrators never make the creative transition from illustrator to ‘adapted by’ to author/illustrator, and remain mired in the middle category. Michael Hague and Barry Moser come to mind, and to a certain extent, Jerry Pinkney. Even today, over forty years into his highly succussful illustration career, Pinkney has only modestly delved into authorship, and most of these works have been published in the past ten years. Lion & the Mouse, Pinkney’s Caldecott Medal book, is a wordless book based upon the classic Aesop’s Fable, a story in the public domain. 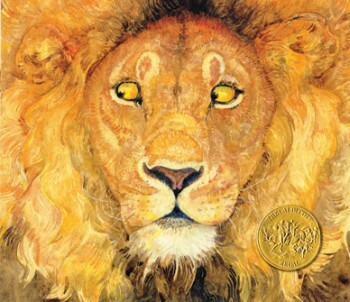 Jerry Pinkney’s watercolors are highly detailed along a realistic style, unusual for a children’s book illustrator. HIs animals, even in animorphic poses, have dimensions with realistically correct symmetries to the based-upon creature. Pinkney’s illustrations have a calming almost sombre undertone, and appeal to adults nearly as much as they appeal to small children. 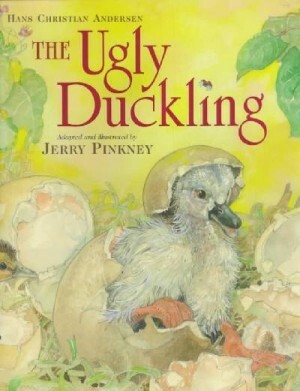 Pinkney uses an earth-tone natural color palette, one not biased toward the simplistic bold four-colors one often finds in children’s books. This style has remained consistent over the course of his forty year career. When Eric Rohmann won the Caldecott Medal for My Friend Rabbit in 2003 using a drastically modified style, one with broad bold swooping outlines and cartoon-like simplicity, a number of established illustrators altered their style in response. Not Pinkney, who stayed true to the form met with so much success in the market. Reading a Pinkney-illustrated picturebook to a young child is a calming experience. The pictures are often more important than the words, and while there is always a focal point to the illustration, it doesn’t jump out at the child as is the norm. There is not one focal point, rather many things for the eye to focus upon. The child’s eye and mind have to work a bit to gather in the entire scene. 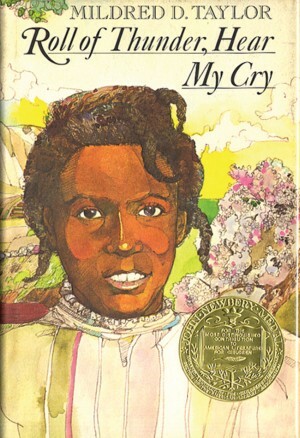 Pinkney’s most valuable book is the 1977 Newbery Medal winner Roll Of Thunder, Hear My Cry, written by Mildred Taylor. First edition Newbery Medal books have a passionate collector following, especially among librarians and educators, so is the primary driver of the relatively high market price. There are very few Newbery Medal books with jacket illustrations and/or adornments by a Caldecott Medalist illustrator, so another big positive. Lastly, this book has a strong cross-current as an African-American collectible because of author, illustrator, and subject. I expect the market value of this book to increase considerably over the next decade. before 1990 were printed in smaller numbers than those post-1990 due his growing marketability. Lion & The Mouse, the 2010 Caldecott Medal book, is also Pinkney’s first attempt at a wordless book – let’s hope it’s not his last. Pinkney’s visual story telling is remarkably evident and will capture the imagination of small children for years to come. I’m unsure of the size of the initial printing, so the coming months will tell more about the potential appreciation once the first editions are absorbed by the collecting hobby. Given the overall collectibility of Pinkney’s body of work, I expect the demand for the first edition to outstrip the supply. Because of his 40-plus year continuum, productivity, and well-deserved noteriety, Pinkney’s early books have become quite valuable. He has been an illustrator commercially since 1965, with nearly 100 books to his credit, and won over 10 major children’s illustration awards. Pinkney’s first book, The Adventures of Spider, is already a tough get, so I expect it has some upside. His second book, This Is Music is another tough get, however the subject matter might be a drag on demand. Among his other early books, I think The Traveling Frog (1966) and Even Tiny Ants Must Sleep (1967) have some potential since they are true picturebooks relying heavily on illustrations to deliver the story. 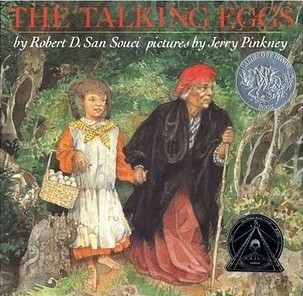 The 1990 Caldecott Honor and Coretta Scott King Honor book, The Talking Eggs, written by Robert D. San Souci, has a little more upside than the three other Caldecott Honor books, John Henry (1994), written by Julius Lester, The Ugly Duckling (1999), and Noah’s Ark (2002) simply due to being a little older, and possibly due to the size of the initial print. I don’t have data to substantiate, however, again, time will tell. Next are the other four Coretta Scott King Medal books, The Patchwork Quilt (1985), written by Valerie Flournoy, Half A Moon And One Whole Star (1986), written by Crescent Dragonwagon, Minty (1996), written by Alan Schroeder, and Goin’ Someplace Special (2001), written by Patricia McKissack. Over time, I think the two pre-1990 Coretta Scott King Medal award books will appreciate more in value then the post-1990 Caldecott Honor books, however the market has not realized this expectation. The notable author books should also be strongly considered in a collectible children’s book collection, especially the Julius Lester and Virginia Hamilton authored books. Pinkney collaborated with Jane Yolen on the 1996 Fever Dream. Pinkney did embellishments for the Franklin Library editions of John Updike’s Rabbit, Run and Rabbit Redux which both command moderately high prices in the market. Finally, I think the books which Pinkney both illustrated and authored/adapted should be musts for any collectible children’s picturebook collection. Currently there is a slight market premium on first edition books authored by an illustrator. In general, I think this premium will increase as the picturebook collecting hobby matures, so consider adding this focus to your collecting habits. Now that the Lion & The Mouse has unleashed Pinkney’s story telling energies, I look forward to his future books. Hi you guys… I’m a very amateur collector and have never tried to sell any of my coveted titles, but alas… the economy calls. I just listed my First Edition Sam and the Firefly on ebay for fun, just to see if it would sell. Anyway, wish me luck!